Quick Easy Outdoor Party Space! 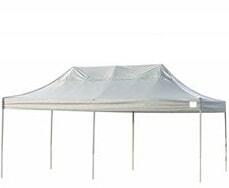 A great addition to keep your guests comfortable and out of the elements! Provides shade for up to 4 tables. Capacity 200 sq.ft. Covers up to 4 Tables or 35 Seats. Minimum space: 20'L x 10'W x 10'H.